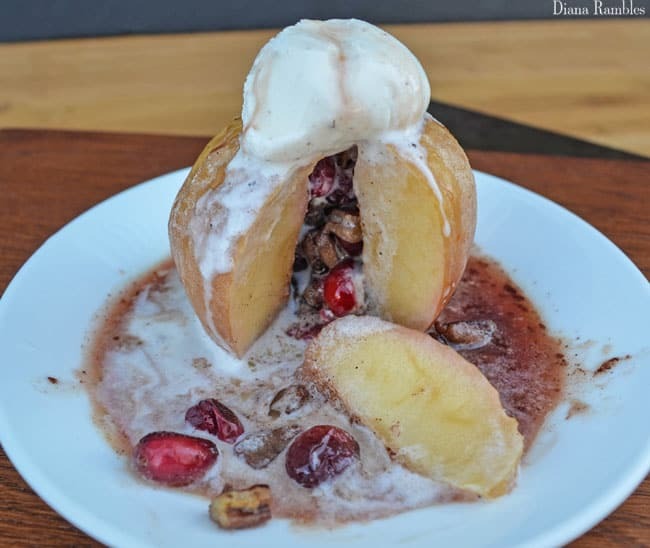 Enjoy this easy recipe for Fresh Cranberry Pecan Baked Apples. On our last camping trip this fall, we made baked apples in the campfire. They were fantastic! My daughter has been asking me to make them in the oven at home. I adapted the recipe and added fresh cranberries to create this amazing treat. 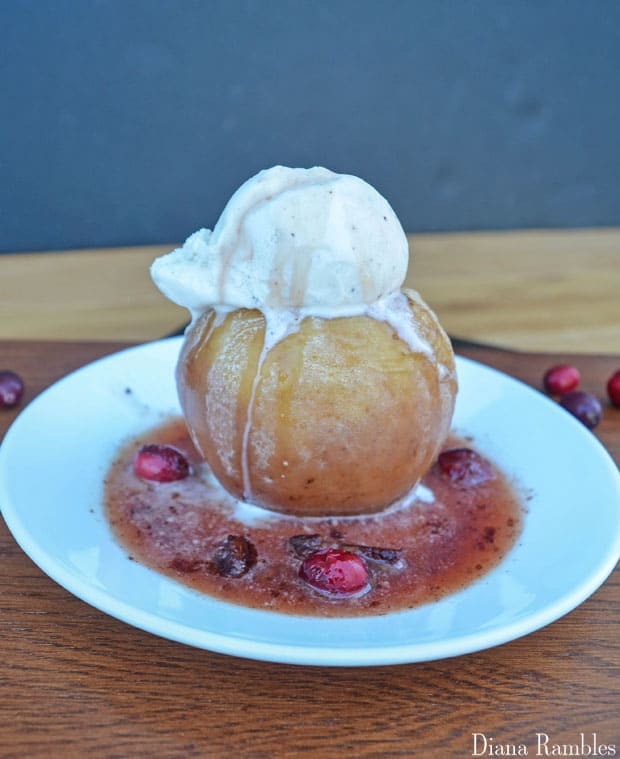 These Cranberry Pecan Baked Apples taste great by themselves but are pushed over the top when served with a scoop of vanilla ice cream. This recipe calls for four apples. I tried both Granny Smith and Ambrosia apples. Granny Smith apples are great in apple pies, but I don’t recommend them for this recipe. I’m sorry the ingredients photo is blurry. 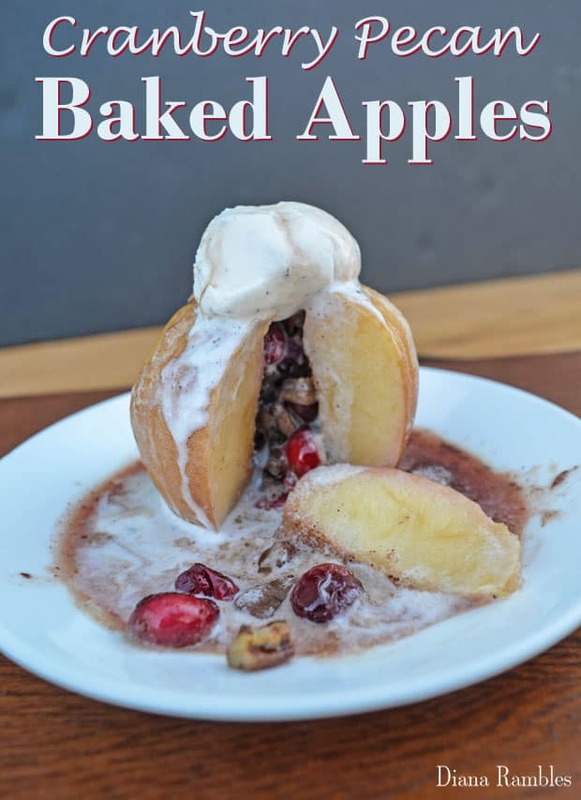 The preparation for these baked apples is really easy. You combine the brown sugar, cinnamon, chopped pecans, and fresh cranberries in a bowl. The apples are cored and placed in a baking dish. Spoon the cranberry mixture into the middle of the apples and top with butter. Pour the cranberry juice into the dish and bake. Get the full recipe at the bottom of the post. The apples are not the prettiest thing I have ever seen when they are done, but they taste beautiful! We gobbled them down very quickly! I even slurped up the juice left in the bottom of the dish. It’s a perfect combination of cranberry and cinnamon. My mouth is watering as I type this up, and I want to make the recipe again right now. I will miss cranberries when the season is over. The recipe could be made using dried cranberries. Mix the brown sugar, cinnamon, pecans, and cranberries in a small bowl. Wash and core the apples. I use this to remove the core. 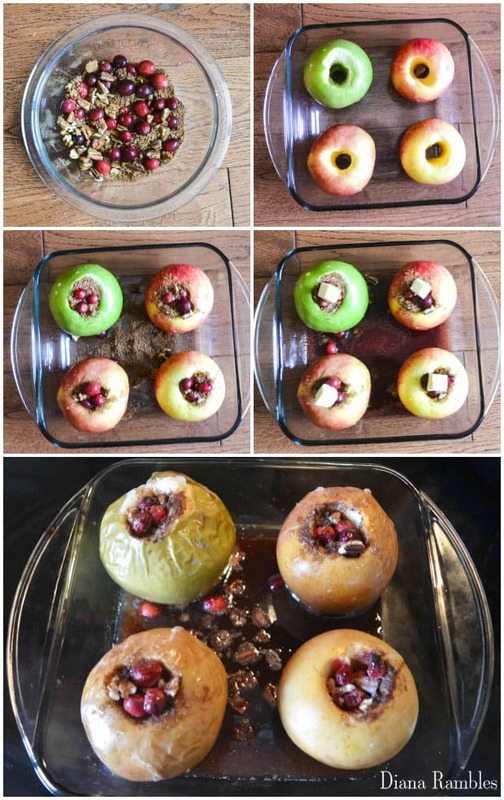 Place the apples in a small baking dish. 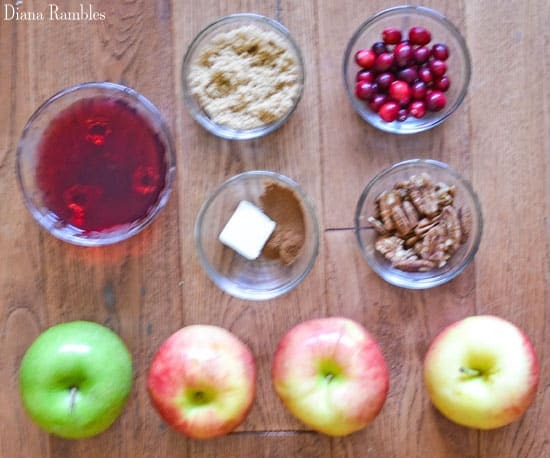 Spoon the cranberry mixture into the middle of each apple. Cut the butter into fourths. Place a piece on each apple. Pour the cranberry juice into the dish. Bake for 45-50 minutes in a 350 degree oven. Top with ice cream and serve immediately. Those look absolutely amazing! 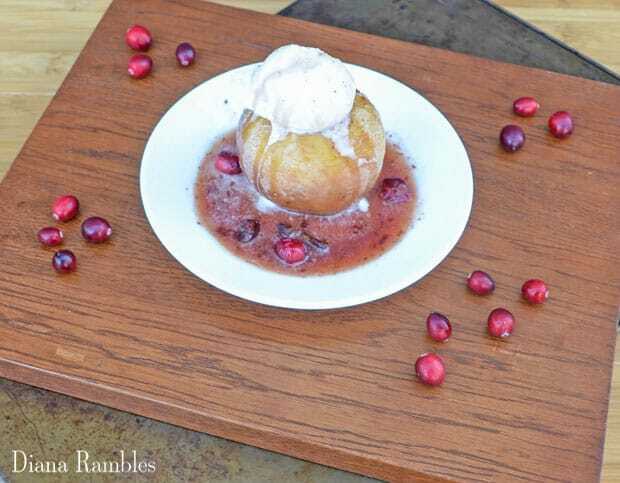 I love this kind of rustic dessert. My family is going to devour these! Now that looks AMAZING! I am not much of a pie person, so this looks like a great alternative to serving pie for dessert. I am not into crust much, so it is a great alternative. Oh my these look so delicious and easy to make. They will be a big hit with my Family. These are going to be a perfect dessert for my dinner party. I will have to get the ingredients I need to do a trial run this week. Whaat!? These are the coolest. I totally have to try this out. I'm loving that combo! Oh yummy! What a delicious idea! I love all these flavors combined!